In the centre of Carmel, the Dan Panorama Haifa is a landmark hotel. This 21-storey tower offers great accommodation with panoramic views and a great range of hotel facilities. 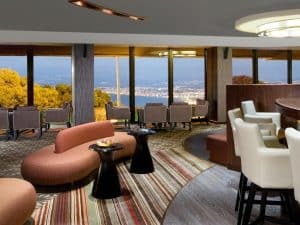 Free WiFi is available throughout the property.Dan Panorama Haifa Hotel’s 266 guest rooms are decorated in a contemporary style and offer fantastic views over Haifa Bay and Mount Carmel. Some rooms offer free access to the exclusive Carmel Lounge. Leisure facilities at the Dan Panorama Haifa include a seasonal outdoor pool and a large fitness centre, one of the best equipped in the country. There is also a separate swimming pool for children plus a kids’ club. The Dan Panorama Haifa is directly linked to the Panorama Mall, with its many shops, restaurants and cafés. The Louis Promenade and the magnificent Bahai Temple are also close to the hotel. The hotel’s restaurant serves international and Israeli cuisine. Breakfast is buffet style.